Dr. Denenberg has over 20 years of experience in the electronics, communications, and computer industries. He has worked for Motorola, Bell Laboratories, ITT, and Prodigy Services Co. prior to joining Noise Cancellation Technologies in 1990 as Vice President, R&D and Chief Technology Officer. Dr. Denenberg received his BS. from Northwestern University in 1966 and both a MS. and Ph.D. from the Illinois Institute of Technology in 1968 and 1970 respectively, all in Electrical Engineering. He is a Senior Member of the IEEE and holds 11 patents. Mr. Claybaugh has been employed at Noise Cancellation Technologies since October, 1991 as Director of NCT Personal Quieting Product Development. His responsibilities include the development of communication headset products and coordination of US-based cabin quieting projects. Prior to joining NCT, he served for 6 years in several capacities in the development of underwater acoustic signal and image processing technology at the US Naval Surface Warfare Center. Mr. Claybaugh received his BA. in mathematics from Saint Vincent College, a BS. in Electrical Engineering from the University of Notre Dame, a MS. in Electrical Engineering from the Johns Hopkins University, and an MBA from the University of Maryland. Environmental noise has been a problem since the industrial revolution. Noise affects our health and safety, interferes with communication, and reduces our ability to enjoy life at its fullest. The application of Active Noise Cancellation to the control of noise was proposed over 50 years ago but at that time was quite impractical. Recent advances in computer technology, however, have now made active noise cancellation a practical solution to many previously difficult problems in environmental noise. The application of active noise cancellation to a headset for use in emergency vehicles produces a light weight headset that selectively reduces the noise level at the ear by 10 to 15 dB. This enhances operator safety, reduces the possibility of hearing damage, and allows effective communication within the vehicle. This technology does not mask the noise. Noise is reduced by generating a canceling anti-noise signal that is equal to, but 180o out of phase with, the offensive noise. This anti-noise is then introduced at the ear such that it matches the noise. The two signals then cancel each other, effectively removing a significant portion of the noise energy at the ear . Active Noise Cancellation is not a new idea. Creating a copy of the noise and using it to cancel the original dates back to the early part of this century. The first systems used a simple "delay and invert" approach and showed some promise, but the variability of real world components limited their effectiveness. In the mid 1970's a major step forward took place with the application of adaptive filters to generate the anti-noise. This greatly enhanced the effectiveness of the systems as they could continuously adapt to changes in their external world as well as changes in their own components. A second breakthrough in the mid 1970's was the recognition that many noise sources, including that made by the sirens used in emergency vehicles, exhibit periodic or tonal noise. This tonal noise allows a more effective solution as each repetition of the noise is similar to the last. The predictability of the noise allows creation of an accurate anti-noise signal. Practical application of this technology still had to wait as the electronic technology available at that time was not sufficient for implementation of Active Noise Cancellation systems. Now digital computer technology has evolved to the point where cost effective Digital Signal Processing (DSP) microcomputers can perform the complex calculations involved in noise cancellation. This technology advance has made it feasible to apply Active Noise Cancellation to previously difficult noise problems at a reasonable cost. Active Mufflers - Reduce exhaust noise from internal combustion engines, compressors, and vacuum pumps without the inefficiencies caused by back pressure. Active Mounts - Contain vibration from rotating machines to improve comfort, decrease wear, and reduce secondary acoustic noise. Active Enclosures - Control low frequency noise with a lightweight enclosure while allowing openings for cooling air flow maintenance access and other purposes. Quiet Zones - Silent Seats and Cabin Quieting to provide comfortable workstations for equipment operators. The noise in emergency vehicles comes from several sources and can be quite strong. We will concentrate here on the loudest of these, the electronic siren (many of the other sources can also be canceled). A typical emergency vehicle siren can generate several different sound patterns. 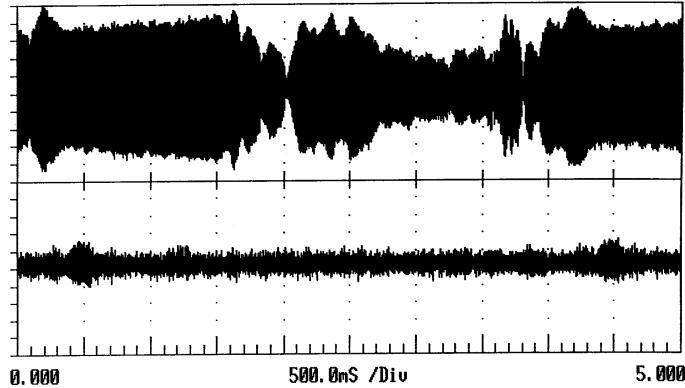 A typical noise pattern from an electronic siren available in the Japanese market is the “Fast Wail.” In this siren the signal sent to the siren speaker is a high level square wave with a cyclically varying frequency as shown in Figure 1. The modulation cycle is over a four second period with a fast rise time and a slower fall time. The frequency varies between 400 Hz and 800 Hz during each cycle. The noise as heard in the vehicle cab is actually much more complex due to the acoustics of the cab. Resonances and multiple acoustical paths cause the noise to vary rapidly in amplitude as the frequency slews. The resulting noise waveform is shown in the section on results as measured in a vehicle cab. This problem requires a system that can adapt at a rate faster than the rate of change of the noise. Most cancellation systems either suffer from a slow adaptation rate or require a reference signal predictably in advance of the noise to be canceled. Since the only reference signal available is the siren drive signal and the relationship between this signal and the noise at the ear is non-linear and varies with head position, neither the classical feed forward nor the synchronous noise cancellation algorithms can provide a good solution. A solution was found in NCT’s patented Digital Asynchronous algorithm. When a single tone is much stronger than other sounds, this feedback algorithm can adapt to that tone at a rate that is on the order of twice the sum of the noise cycle period (between 1.25 and 2.5 milliseconds for this noise) and the total delay around the feedback loop (about 0.5 milliseconds including the headset, analog filters and a small number of digital sampling periods to allow algorithm processing time). It therefore can typically adapt to changes in this noise in 5 milliseconds which is much faster than the rate of change. Headset - A light-weight, open-back unit allowing external signals to pass to the ear with little passive attenuation. It has a broadband speaker to minimize signal delay. Equalizer - A filter that is equivalent to the effect the anti-noise path has on the anti-noise. The result is added to the Residual signal to derive the Reference, a signal that approximates the original noise at the ear before cancellation. Adaptive Filter - A Finite Impulse Response filter. Its tap weights are continuously adjusted to generate the anti-noise signal from the Reference signal. Figure 4 is a block diagram of the DSP hardware required to execute the cancellation algorithm. The prototype hardware was jointly developed by Noise Cancellation Technologies and Foster Electric. It is a complete one board system that fits into a case that is only 2½ cm high by 20 cm wide by 16 cm deep and supports two channels of processing (one for each ear). It uses standard 12 volt power from the vehicle. Anti-Aliasing Filters - These filters limit the bandwidth of the residual signals to that of the noise (400 to 800 hertz for the described siren signal). They are designed to reject energy outside this band to avoid aliasing (the tendency for signals above one half of the sampling rate to get translated in frequency by the sampling process) while minimizing the time delay incurred in the filtering process . A/D Converters - The residual noise signals are converted to digital form by specially designed Analog to Digital converters. They operate at a 10 kHz sampling rate to minimize delay and have 12 bit accuracy to have sufficient dynamic range to handle changing noise conditions. 16 Bit DSP - The prototype system uses a TMS 320C25 DSP processor from Texas Instruments. This is one of several DSP chips that can achieve good results. Others include the Analog Devices 2100 series and the Motorola 56000 series. Program ROM - The algorithm is written in the assembly language of the DSP chip to maintain efficient use of the processing resources. The resulting machine language program is stored in an external Read Only Memory chip (Production units are likely to use ROM memory that is on the DSP chip). D/A Converters - The Digital to Analog converters are used to generate the output anti-noise signals. They are also designed to minimize signal delay and have 12 bit accuracy at the 10 kHz sampling rate. Reconstruction Filters - The output from the D/A converters contain copies of the desired anti-noise at frequencies that are multiples of the sampling rate. These are removed by filters similar to those used for anti-aliasing. Power Supply - The power supply is a high efficiency switching supply that accepts the vehicle battery voltage (nominally 12 V) and generates the required set of precision voltages for the analog and digital electronics in the controller. The lower half shows the result when the active cancellation system is turned on. The system reliably reduces the siren noise by 10 to 15 dB with little impact on other external sounds. This system has also been successfully tested on US standard electronic sirens which have even faster variation. It is currently under field test by a metropolitan area Emergency Medical Service on the east coast of the US. Enhanced operator safety since the operator’s ability to hear external warning signals is improved. Reduced possibility of hearing damage due to a lowered noise level. Better intelligibility for communications within the vehicle since the open back headset allows speech in with little attenuation.